Description: Dating from the period between the Franco-Prussian War and World War I, these works (most of them first recordings) recall a lost genre: the choruses for "equal voices", when girls and boys were separated for education. These are choruses written for teenage girls, some poetry borders on the derisible (for which the mordantly witty notes make no excuses), but all exhibiting the excellent compositional craft you would expect of their composers. Four piano pieces by Franck and Delibes add to the rarity. French texts. 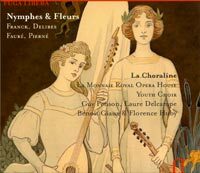 La Choraline (La Mannaie Royal Opera House Youth Choir), Guy Penson (1892 Érard piano), Laure Delcampe (soprano).